Preliminary looks like it's going to group with the same rounds as the revolver though. That would make it much more easy. And a round you've tried and trusted. I've settled on 240gns hard cast and getting around 2 inch groups consistently, and are hard hitters. I'm happy with that. I've only ever been a bush shooter and have been going to a range for eighteen months. Before that it was out the window of my truck at a notch on a tree somewhere. 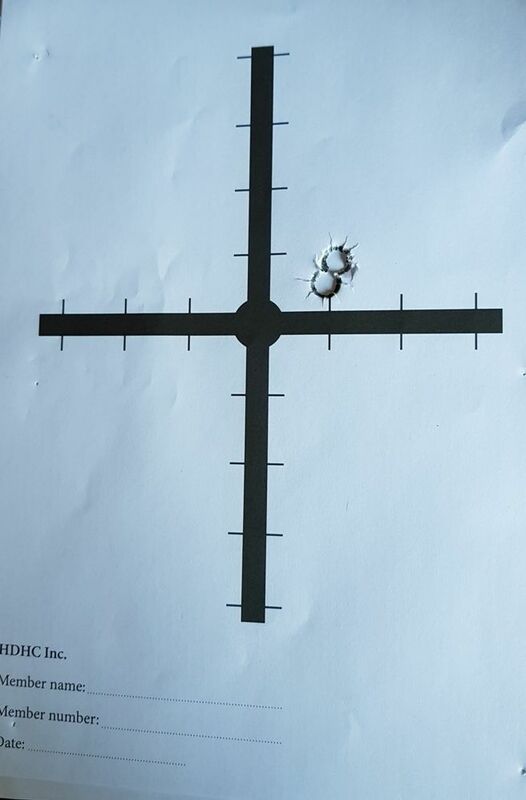 Two shots from my 44 at 100 meters, didn't want to try for a third in case I buggered it up. You shoot that with open sights Ian? That's dang good! Yes, I'm shooting a tried and tested many times over load, at least out of the revolver. It should hit harder yet out of the carbine. I'm shooting the Speer Gold Dot 270 grain bullets. They are lead-nosed and copper-jacketed, not hollow points. I don't remember the powder charge off the top of my head, but they've got room to go hotter yet. Everything you hit folds though, so I've never seen reason to push it harder. A kid could shoot this carbine with that load right now, so I'm pretty pleased. No, my eyes are too bad for open sights these days. I have a fixed 2.5 power Leupold on it, still weak, but helps a lot. Never shot a .44mag revoler, the largest I owned was a .357mag Colt Python, it was sweet to shoot. Finally a bit of Autumn weather, and I'm loving it. Hope everyone is going well! We are still fighting winter here. It hits the mid 60's then snows the next day. Winter was mild this year, but it doesn't want to go away. I'm dog tired. Day 3 off dealing with wildfires. 30 hours worked in the last 2 days and heading in for a scheduled 12 hour shift in a few. We've had a bad one going on the outskirts of Sydney for a week or so, deliberately lit. Police are running an investigation currently, I hope they catch the person or persons who lit it. Surprisingly, they do catch many of them. Good luck MB. Stay safe and be careful out there. One more day. Wildfire is taken care of but I have to cover staffing shortages on my normal day off. I am dog tired. But at least I am not scheduled for a full shift. If I'm lucky I'll be out in 6 or 8 hours. As D/B said, be careful and stay safe. Generated in 0.159 seconds in which 0.147 seconds were spent on a total of 14 queries. Zlib compression enabled.